(CNN) -- Newcastle's 16-year stay in the English Premier League has come to an end as a Damien Duff own goal saw them lose 1-0 at Aston Villa. 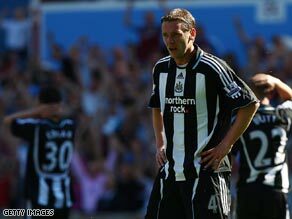 Newcastle players react after Damien Duff's own goal sees them relegated from the Premier League. Duff deflected a 38th-minute shot from Gareth Barry past his own keeper Steve Harper to seal Newcastle's fate. Newcastle's misery was complete when defender David Edgar was sent off for a late challenge on England winger Ashley Young. The result meant Magpies legend Alan Shearer failed to work the miracle he was brought in to try and achieve with eight games remaining. Newcastle will be joined in the Championship by Middlesbrough, who were beaten 2-1 at West Ham and West Bromwich Albion, whose relegation was already confirmed prior to Sunday's final matches. Both Hull and Sunderland survived the drop, despite both also losing their final matches. Hull were beaten 1-0 at home by a second-string Manchester United side, while Sunderland lost 3-2 at home to Chelsea in Guus Hiddink's final game in charge of the London side. Despite escaping relegation, Sunderland manager Ricky Sbragia -- who had only been in charge for five months after Roy Keane's relegation -- announced his decision to resign at the end of their match. Meanwhile, Newcastle have paid the price for a season of instability ever since Kevin Keegan decided to quit as manager in early September and owner Mike Ashley decided to put the club up for sale. Joe Kinnear was brought in to try and rescue the situation until his heart problems terminated his involvement and led to former England and Newcastle striker Shearer getting the call. But it was always going to be an uphill task to reverse a season of under-achievement and turmoil in such a short space of time. Now Shearer has to decide whether he wants to take on the task of trying to help the Magpies regain their top flight status and is due to have talks with Ashley early next week. "It's painful and it hurts. It's been a great experience for me and in a weird way I have enjoyed it," Shearer told Sky Sports. "But lets get something straight, we didn't go down because of today, but because we weren't good enough after 38 games. "Big changes need to be made at this club, players need to go and others have to arrive because, collectively, we were not good enough to survive." Newcastle's result ensured Hull stayed in the Premier League, despite their defeat against champions Manchester United. As expected, United manager Alex Ferguson put out a reserve side with one eye on Wednesday's Champions League final against Barcelona, but they still proved too strong for the home side and Darren Gibson's superb first half long-range strike proved enough for the visitors. Second-bottom Middlesbrough will join the Magpies and already-relegated West Brom in the Championship after their defeat at Upton Park. The hosts went ahead after 33 minutes when Carlton Cole sidefooted past goalkeeper Brad Jones and although Gary O'Neill hit an equalizer shortly after the break, the Hammers won the match eight minutes later through Junior Stanislas. Sunderland were the only other side in danger of getting relegated at the start of play and had other results to thank for their survival after they were beaten by Chelsea. Nicolas Anelka claimed the season's Golden Boot award in style with a wonder-strike, his 19th of the season, two minutes into the second half. Kieran Richardson took advantage of Petr Cech's fumble to level but Salomon Kalou gave the visitors the lead again in the 74th minute and Ashley Cole wrapped up the win in the final 10 minutes. Kenwyne Jones scored a late consolation goal for Sunderland, who will now be looking for a new manager following Sbragia's announcement, although the Scotsman will remain on the coaching staff. Everton finish the table in fifth place after a 2-0 victory at Fulham, who have qualified for the Europa League in seventh place despite the defeat. Leon Osman hit both goals for the Toffees, but Roy Hodgson's team retained seventh as Tottenham were beaten 3-1 by Liverpool. The hosts took the lead in the first-half thanks to Fernando Torres' header and Alan Hutton's own goal made it two after the break. Robbie Keane pulled one back against his former club with a quarter of an hour to go, but Yossi Benayoun netted Liverpool's third nine minutes from time. Elsewhere, Arsenal were in a rampant mood at the Emirates Stadium, demolishing Stoke in the first half on the way to a 4-1 victory. The Gunners opened the scoring on 10 minutes when striker James Beattie slotted the ball into his own net from Cesc Fabregas' cross. The hosts then made it 2-0 on the quarter hour when Robin van Persie was brought down by Ryan Shawcross and then converted the resulting spot-kick. Frenchman Abou Diaby headed home a a third goal two minutes later before Stoke pulled one back through a Ricardo Fuller penalty. Van Persie completed the scoring with his second of the game, taking advantage of a mistake from Rory Delap.